We are pleased to present you with the Annual Education Report (AER) which provides key information on the 2017-18 educational progress for the Au Gres-Sims School District and our schools. The AER addresses the complex reporting information required by federal and some requirements of state laws. Our staff is available to help you understand this information. Please contact Jeffrey Collier, Superintendent, at 989-876-7150 for help if you need assistance. The DISTRICT AER is available for you to review electronically by visiting the following web site https://www.mischooldata.org, or you may review a copy in the main office at your child’s school. Each school will also be communicating their own AER to parents directly. Student Assessment Data – Includes the following three assessments: M-STEP (Michigan Student Test of Educational Progress), MI-Access (Alternate Assessment), and College Board SAT. Presents assessment information for English language arts and mathematics for grades 3 to 8 and 11, and science for grades 4, 7, and 11, compared to state averages for all students as well as subgroups of students. The report helps users to understand achievement performance within grades and schools, and to make comparisons to district, state, and national achievement benchmarks. Accountability – Detail Data and Status The accountability portion of the AER includes assessment proficiency and participation rates, graduation or attendance rates, as well as accountability index values showing school performance on a 0-100 scale. Review the table below listing our schools. For the 2017-18 school year, schools were identified using new definitions and labels as required in the Every Student Succeeds Act (ESSA). A Targeted Support and Improvement (TSI) school is one that has at least one underperforming student subgroup. An Additional Targeted Support (ATS) school is one that has three or more underperforming student subgroups. A Comprehensive Support and Improvement (CSI) school is one whose performance is in the lowest 5% of all schools in the state. Some schools are not identified with any of these labels. In these cases, no status label is given. As Superintendent of the Au Gres-Sims School District, I am pleased to share this annual report with you and also wish to express my gratitude to all of our constituents for being an integral part of our school district's overall success. I remain encouraged by the continued excellence in academic achievement exhibited by our student body, and proud of the awards our students and faculty have earned. 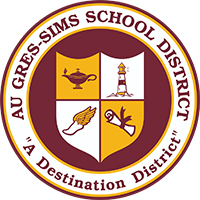 Au Gres-Sims School District, a "Destination District," is located in Arenac County, Michigan. The district is nestled on the sunrise side of Lake Huron and includes the Charity Islands. There are roughly 27 miles of shoreline, which ranges from natural frontage and sugar sand beaches to residential property. Au Gres is renowned for offering an incredible quality of life, abundant natural resources, and a rich cultural history. Au Gres-Sims School District is proud to be known as a “public school with a private school feel” for its combined strength in academic achievement and entire preschool through twelfth grade school experiences. Au Gres-Sims is a progressive district that is recognized statewide, as well as nationally, for consistently and proactively modeling best educational practices using data-driven research and advanced technology. The district remains dedicated to creating a Culture of Learning that provides career and college resource opportunities for learners to gain advanced skill acquisition for an internationally competitive job market within a global economy. To learn more about Au Gres-Sims School District, visit: www.ags-schools.org.